DON'T LET THE "FACTORY SECOND" LINE FOOL YOU, THIS ONLY MEANS MORE DELICIOUSLY LAYERED, LARD FRIED CRUNCH. WE ATE THESE WITH COLD BEERS AS WELL AS WITH PROSECCO AND CAVIAR. 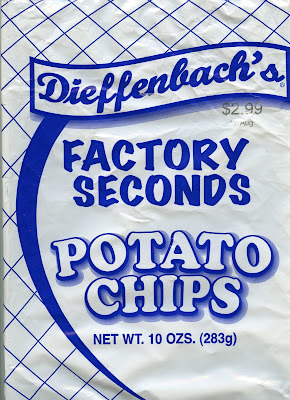 (DOMESTIC, OF COURSE) THEY ARE PERFECTION IN A POTATO CHIP. WE PICKED OURS UP AT DIETRICH'S IN PENNSYLVANIA.